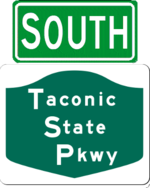 The Taconic is a scenic parkway on the east side of the Hudson parallel to the Thruway and US 9. Construction began in the 1920s and took 40 years to complete. Much of the section was envisioned as an extension of the Bronx River Parkway to the Bear Mountain Bridge, instead built as part of the Taconic and the portion to the west becoming the Bear Mountain State Parkway. At one time, FDR envisioned extending the road to Canada, but with the construction of the Thruway, the northern plans were truncated to there (though there were thoughts of extending it to US 20). The parkway has recieved several upgrades over the years, most notably in Westchester County. 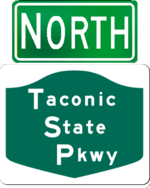 At present, there are no plans to change the at-grade intersections north of NY 199.